A festival celebrated in Thailand called Songkran. Here water is used playfully to douse one another. For three days in April, the entire population of Chiang Mai gathers along the moats that surround the historic section of the city. Drenched and smiling faces pack the sidewalks, while pickup trucks decked out in festive ribbons and special paint, as well as tuk-tuks with their roofs taken off, inch bumper-to-bumper down the road. Children wear traditional Thai outfits and teens sport water pistols and festive masks. Bars blast traditional and Western music, while young Thais and Westerners dance and throw water from their doorways. Huge plastic barrels full of water sit at small intervals on the sidewalks to serve as communal refilling stations. Carts piled high with blocks of ice make their way down the street, making a lucrative business of cooling people’s water supplies. This is the Songkran water festival. Songkran marks the end of the hot season and the beginning of the cooling, refreshing rains which cleanse the countryside from the thick smoke caused by clearing and burning fields. Water is a precious resource in Thai culture, being the essential nourishment for rice and life in general. Songkran is like the beginning of spring in the West; it generates new life and the new rice season. Most importantly, it marks the traditional New Year of Thailand. It is the time to wash away the bad luck and impurities of the old year and begin anew with a clean soul. All of the rituals of Songkran revolve around cleansing and preparing for the new year. Traditionally, the first day of this 3-day festival is the day for “spring cleaning”—getting rid of all the dirt—literal and spiritual—collected during the past year. Buddha images and shrines are meticulously washed. You are expected to burn your trash on this day and wear new clothes the next day—which marks the new year. Anything old or no longer of use will bring bad luck if carried into the new year. The second day should be marked with optimism, positive thoughts, and kind words to ensure a prosperous new year. On the final day, people pray and make do good deeds to initiate the new year. Extra alms are offered to monks, and sand is brought to the temples in order to replace the dirt that they have carried out with feet in the past year. The sand is shaped into little stupas—miniature sand-sculptures which you can view at temples during the Songkran festival. Buddha statues are paraded through the streets in order for people can throw water at them, respectfully “bathing” the holy images. Throughout the festival, a strong emphasis is placed on renewing traditional family values by showing respect and deference to elders. This is where the practice of throwing water comes from; it began by pouring scented water on the hands of elders to show respect and ask for blessings for the new year. Today the celebrations have changed a little. The respectful water-dripping has turned into a full-out water war among bucket-wielding revelers. Children bearing high-powered water guns blast ice water onto those passing by, who return the favor by sloshing buckets of dirty river water onto their heads. Friends slip chunks of ice down each other’s shirts, and the more adventurous push each other into the moat. Like most Thai celebrations, the quest for fun tends to outweigh concerns for safety. There have been reports of drowning in the river and moats, to complement the annual spike in road accidents. 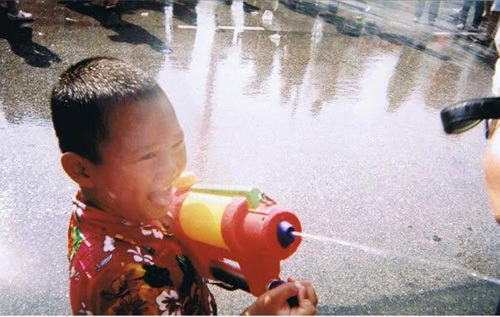 Many seasoned expatriates view the holiday with irritation, because the intoxicating excitement of a city-wide water fight can lose its novelty after a couple of years, and the inconveniences and dangers start to outweigh the fun. I decided my first day of Songkran would be done the Thai way: from the back of a pickup truck loaded with plastic water barrels. The scene at Thapae Gate was one of indescribable mayhem. I had no idea that so many people lived in Chiang Mai. As I stared in amazement, taking in all the action and movement and noise around me, a small ice floe suddenly made its way down my back. Startled out of my reverie by the unexpected cold, I screamed and turned to locate the villain. A grinning ten-year-old giggled mischievously, and I quickly dunked my bucket into the closest barrel and threw the water over his head. He spluttered and wiped the water out of his eyes, then regained his ear-to-ear grin and waved goodbye. I opened my mouth to say “Sawatdee ka!” but was immediately silenced with a slap of sour-tasting moat water. Coughing and blind, I stabbed my bucket into the barrel of water and tossed the water out of the truck. I cleared my eyes and saw two grinning young men shouting “Sawatdee pee mai krap!” (Happy New Year) in unison as they poured more moat water over both my shoulders. The next two days gave me the opportunity to compare the Thai attitude and that of expatriates and tourists towards Songkran. For Westerners the festival is a big water fight, tinged with a feeling of competition and rivalry. Neighboring bars wage ambushes on each other, mounting ever larger attacks in an attempt to make the other concede defeat. In this highly-charged atmosphere, amplified by all-day binge drinking, it is easy for things to get out of hand. Overall it was a fun, happy environment, but it was not infused with the benevolent communal bliss that characterized the Thai festivities. For Thais, it is a celebration rich with tradition, embodying community spirit and celebrating life and the new year. Smacking you in the face with a bucket of ice water may not sound very friendly, but remember that it stems from a ceremony of respect, and there is no malice or challenge intended in any way. First of all, remember that it’s all in fun. No one means you any ill-will, but probably no one will heed your pleas if you ask them not to throw water at you. It is part of the festival to get soaked, so if you get tired of it you better take refuge in your room. And do not take anything that cannot get wet outside—leave your phone, camera, leather purse, etc. at home. If you want souvenirs to remember your Songkran experience, a waterproof disposable camera is worth the investment. Take every effort to avoid drinking the moat water; many people end up with a stomach bug or ear infection after their first festival. Cover your beer when you’re not sipping it, keep your mouth closed when you are not laughing or screaming, and take a good shower afterwards. Finally, be safe. Do not drive a motorbike, try to stay off the roads, and do not let anyone talk you into going for a swim when you are drunk. Now you are ready to enjoy the biggest water-fight of your life! When? Songkran officially takes place on the 13-15th of April each year (plus a few days before and after, unofficially). Where? It can be celebrated in most cities in Thailand, but the favorites for travelers are Bangkok, Chiang Mai, or Pattaya. Where to stay? Within walking range of the main festivities; for example, near Thapae Gate in Chiang Mai or KhaoSan Road in Bangkok. Book your accommodations early as this is a popular time to visit! Who? Fun for the family, the young, and the sociable traveler. Why? Read more about the Songkran festival’s roots. Gwyneth Chew has been living and traveling in Asia since 2000. She lived and taught English in Chiang Mai, Thailand.